Nowadays, gathering data is one of the keys to understanding how products are perceived. Gathering some data from users can help you build better products and understand your users. However, all the data in the world would be useless without a way to visualize it. In this article, we will explore how to create a simple realtime chart in iOS. The chart will receive data and update in realtime to the screens of everyone currently logged into your application. We will assume this is a chart that monitors how many visitors are using a website. Let’s begin. 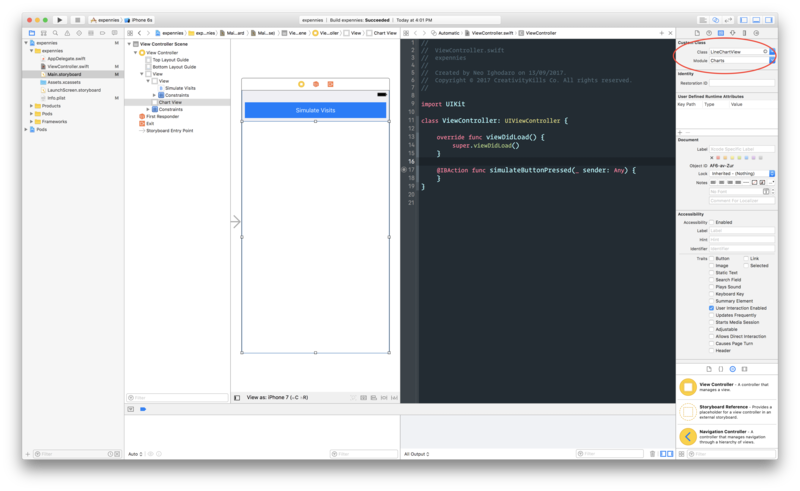 Basic knowledge of Swift and using Xcode. Cocoapods ****installed on your machine. When you have all the requirements, then we can begin. 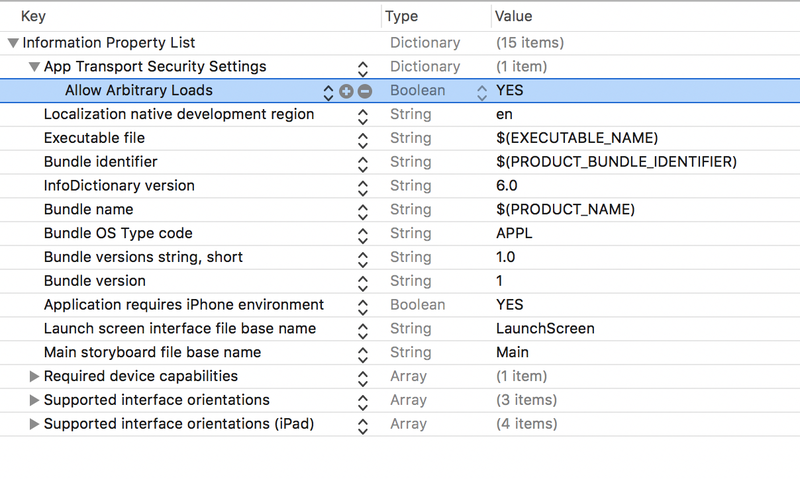 Launch Xcode on your Mac and create a new project (call it whatever you want). Follow the new application wizard and create a new Single-page application. Once the project has been created, close Xcode and launch your terminal application. Save the Podfile and then go to your terminal and run the command: pod install. Running this command will install all the third-party packages we need to build our realtime iOS chart application. 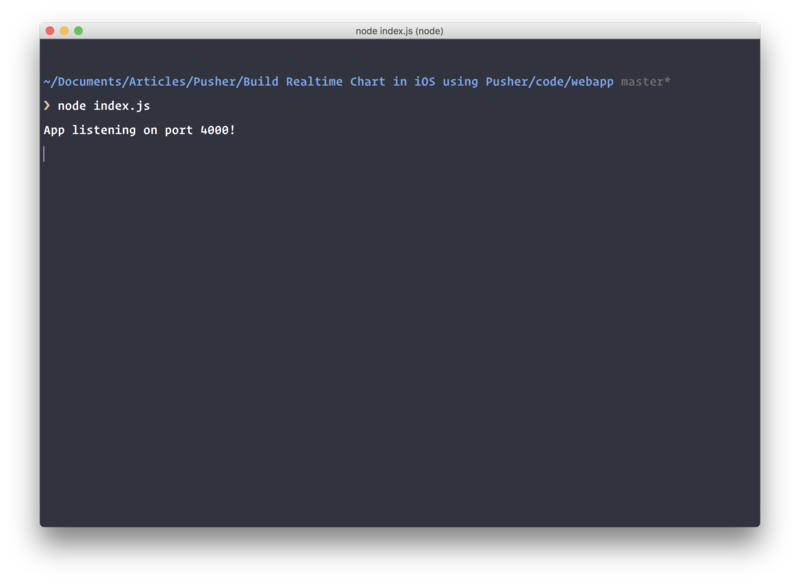 The first package it will install is Charts, which is a package for making beautiful charts on iOS. The second package is the Pusher swift SDK. The last package is Alamofire, a package for making HTTP requests on iOS. Once the installation is complete, open the **.xcworkspace** file in your project directory root. This should launch Xcode. Now we are ready to start creating our iOS application. To begin, we will create the necessary views we need for our realtime chart application. Open the Main.storyboard file and let’s start designing our view. First, create a rectangular view from edge to edge at the top of the View Controller in the storyboard. In that view, add a button and add the title “Simulate Visits”. Next, create another view that is also a rectangle, spanning from the end of the first view above to the bottom of the screen. This view will be where we will render the realtime chart. When you are done creating the views, you should have something like shown in the image below. As it currently stands, the views do nothing. Let us connect some functionality to the iOS chart application view. As said before, our application’s views and buttons are not connected to our ViewController so let’s fix that. Great! Now that you have created the first link, we will have to create one more link to the chart view. On your storyboard, click the view and on the “Identity Inspection” tab, make sure the view is connected to LineChartView as seen below. @IBOutlet weak var chartView: LineChartView! Finally, at the top of the ViewController import the Charts package. 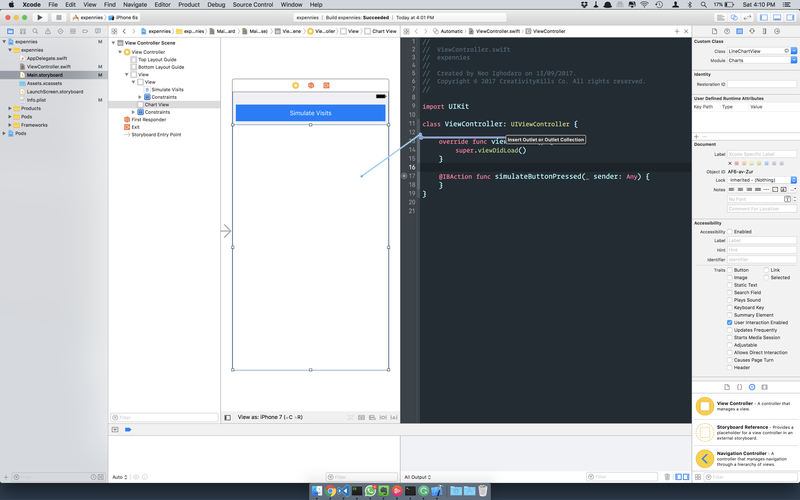 You can add the code below right under import UIKit in the ViewController. Now that we have linked both elements to our code, every time the Simulate Visits button is pressed, the simulateButtonPressed function will be called. The final piece of the puzzle will be displaying a chart and making it update in realtime across all devices viewing the chart. Create a function that updates our chart depending on the numbers. Make our request button call the backend which will in turn send simulated data to Pusher. Create a function that listens for events from Pusher and, when one is received, it triggers the update chart function we created earlier. In the code above, we declare chartEntry where we intend to store all our chart data. Then we loop through the available visitors and, for each of them, we add a new ChartDataEntry(x: Double(i), y: visitors[i]) that tells the chart the X and Y positions. We set the color the line chart will be displayed in. We create the LineChartData and add the line which contains our data points. Finally, we add the data to the chartView and set the chart view description. The next thing we need to do is make our request button trigger a backend which will in turn send simulated data to Pusher. In the code below, we use Alamofire to send a POST request to http://localhost:4000/simulate which is a local web server (we will create this backend soon). In a real application, this will typically point to a real web server. This endpoint does not take any parameters in order to keep the tutorial simple. We also do not need to do anything with the response. We just need the POST request to be sent every time the simulate visits button is pressed. To make all this work, we will create a function that listens for events from Pusher and, when one is received, we save the value to visitors and then trigger the update chart function we created earlier. In the code above, we instantiate Pusher and pass in our key and the cluster (you can get your key and cluster from your Pusher application’s dashboard). We then subscribe to the visitorsChannel and bind to the event name addNumber on that channel. When the event is triggered, we fire the logic in the callback which simply appends the count to visitors and then calls the updateChart function, which updates the actual Chart in realtime. Finally we call pusher.connect() which forms the connection to Pusher. That’s all! 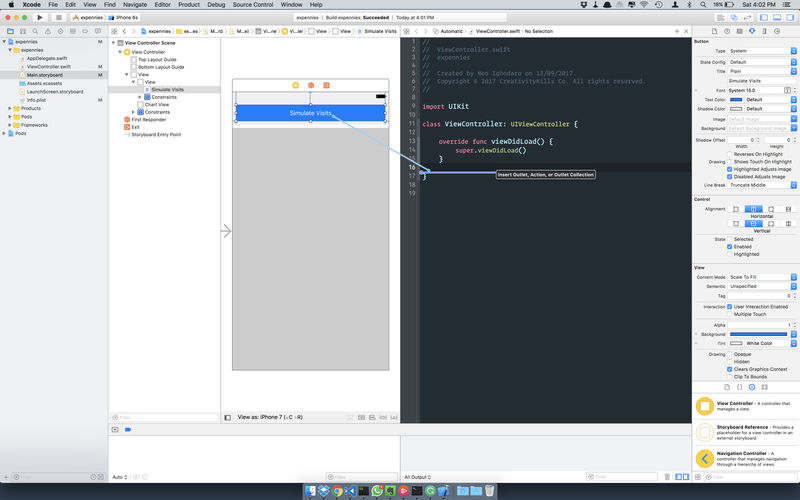 We have created our application in Xcode and we are ready for testing. However, to test, we need to create the backend that we send a POST request to when the button is clicked. To create this backend, we will be using Node.js. Let’s do that now. To make it a little easier, we use setInterval to send a random visitor count to the Pusher backend every 2000 milliseconds. After looping for 20 times, the loop stops. This should be sufficient to test our application. Replace the PUSHER_APP_* keys with the credentials from your own Pusher application. In this file we simply declare dependencies. 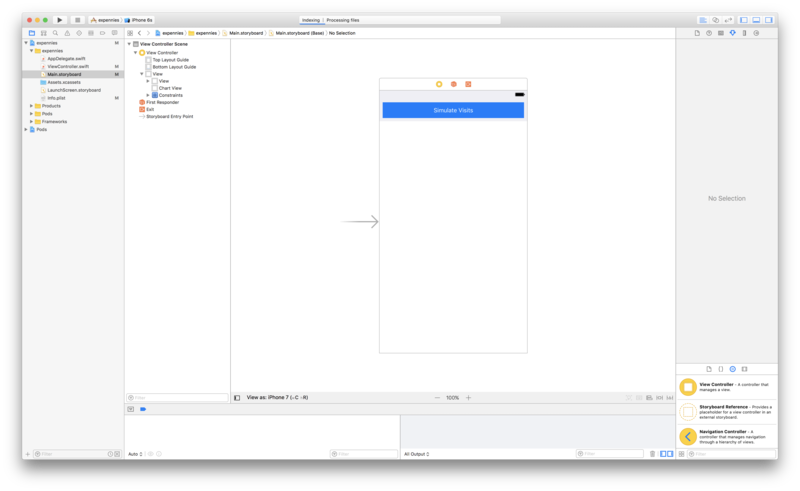 This article has shown you how you can combine Pusher and the Charts package to create a realtime iOS chart application. There are many other chart types you can create using the package but, for brevity, we have done the easiest. You can explore the other chart types and even pass in multiple data points per request.